Stem cell engineering has received overwhelming response in past few years. Stem cell technology has enabled the scientist to develop organs and body parts which has opened an entire horizon for doctors in reconstructive surgery. stem cells are multipotent cells that have the potential to differentiate into a variety of cell types which differentiate into different types of tissues and give rise to organs and structures of living body. Placenta and umblical cord is a popular media for harvesting embryonic stem cells but recently dental pulp stem cells (DPSC) have been explored for their potential. Discovered in 2005 by Dr. Irina Kerkis and followed by several clinical trials, dental pulp has been proved to be potent source for stem cells. Human stem cells have been isolated from the dental pulp, exfoliated deciduous teeth, the periodontal ligament, the dental follicle and the dental papilla. Dental pulp is situated in the canals of the teeth (root canal and pulp chamber) and every teeth has different form of canal, hence variable amount of dental pulp. 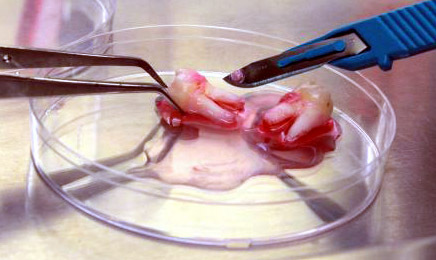 The stem cells in the dental pulp is mesenchymal type which holds the future potential to differentiate into a variety of other cell types such as myocardiocytes (cardiac), neuronal (nerve and brain), myocytes (muscle), osteocytes (bone), chondrocytes (cartilage), adipocytes (fat) and others. Several studies have presented successful regeneration of tissue and organ lines in vitro and in vivo. Gandia et al has demonstrated improved ventricular function and treatment of myocardial infarct in animal models. Dr. Cesar Borlongan at Center of Excellence for Aging and Brain Repair, USF in his study concludes that the stem cells may repair brain injuries. More promising studies have focused on treatment of diabetes, skeletal and cardiac pathologies, congenital malformations such as cleft lip and palate. Dental pulp has benefits over other sources (umblical cord, bone marrow, fat, etc.). The process is least invasive. All you need to do is bank your dental pulp after extraction of deciduous (temporary) teeth or permanent teeth removed by your orthodontist or dentist. Dental pulp provides reliable amount of mesenchymal cells which as already discussed can be used for various anomalies or injuries to the patient in future. In conclusion, dental pulp is a potent and safe source for stem cells and awareness among general population, dentists, pediatricians and continuous studies are needed to develop DPSC as an established source in tissue engineering. This entry was posted in Dentistry, Stem Cell, Tissue Engineering, Uncategorized. Bookmark the permalink. Must read for thyroid patients!